A-HOTEL.com - Halpa ja Hotellihuoneen Velabishti, Albania. Majoituksen varaus Velabishti ja ympäröivä. Blen Grand in Berat features 3-star accommodation with a garden and a bar. This 3-star hotel offers a 24-hour front desk and free WiFi. Located in Berat in the Berat County region, Hotel Demaj provides accommodation with free WiFi. All units feature air conditioning and a flat-screen TV. Guesthouse Villa Juri features free bikes, garden and shared lounge in Berat. With a bar, the 4-star guest house has air-conditioned rooms with free WiFi, each with a private bathroom. Set in Berat, Bed and Breakfast Juri provides accommodation with free WiFi. All units feature air conditioning and a TV. Eni Guesthouse is offering accommodation in Berat. Among the various facilities of this property are a garden and a terrace. Dena Guesthouse & Art provides free WiFi and rooms with air conditioning in Berat. Guests can enjoy mountain views. Located in Berat, Vila 4 Bed&Breakfast offers accommodation with free WiFi, seating area and flat-screen TV. There is a fully equipped private bathroom with bidet and a hair dryer. Romeo's Guest House is set in Berat and features barbecue facilities and a garden. All rooms feature a kitchen, a flat-screen TV with cable channels, and a shared bathroom. Situated in Berat, Dhimitri's guest house features a garden. Free WiFi is available. Ilia Guest House in Berat has a garden and a terrace. The accommodation offers free WiFi. Boasting a garden, Sara Guesthouse is located in Berat and is 200 metres from Berat Castle. All rooms boast a kitchen and a private bathroom. Situated in Berat, Guest House Himaj offers a garden. Boasting a 24-hour front desk, this property also provides guests with a terrace. Ana’s Rest House in Berat provides accommodation with barbecue facilities, a garden and a bar. The accommodation offers a shared kitchen, and organising tours for guests. Set in Berat, Hotel Gorica provides accommodation with free WiFi. Some units are air conditioned and include a seating area with a flat-screen TV. Featuring a secluded garden with a furnished terrace, Hostel Lorenc is located in Berat, about 700 metres from the UNESCO-protected Mangalem district. Free WiFi access is provided throughout the property. 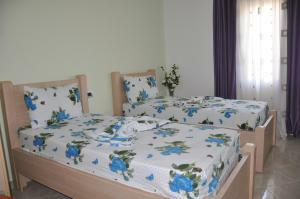 Situated in Berat, Hotel Brilant features air-conditioned rooms with free WiFi. Guests can have a drink at the bar. Maya Hostel Berat is located in Berat and features a garden. Boasting a shared kitchen, this property also provides guests with a terrace. Located in Berat, Vila Palma offers garden, free WiFi, a shared kitchen, and a shared lounge. This villa features a terrace. Situated in Berat, Teo’s Guest House provides a bar. Rooms come with a flat-screen TV with satellite channels. Offering free WiFi and mountain views, Elisa Villa is an accommodation set in Berat. Guests staying at this villa have access to a fully equipped kitchen and a balcony.